Now an easy-to-use engineering software is no surprise. In addition to its sophisticated usability, the engineering software GX Works2 deploys the global mainstream concepts of "grouping" and "structuring" for fundamental improvement of programming efficiency. The world-standard engineering style begins with GX Works2. All capabilities required for PLC engineering including the configuration function of the intelligent function module and simulation function are integrated in a single package. 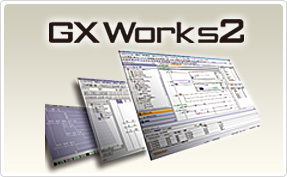 The all-in-one GX Works2 package supports entire engineering such as system design, programming, debug and maintenance. GX Works2 enables you to easily make a full use of high-function and high-performance CPUs and modules. Your legacy GX Developer programs can be used in GX Works2 without any modification. Also, programs written by GX Works2 to the programmable controller can be read using GX Developer. For example, even if GX Developer is installed in a production site's PC, the data created and read with GX Developer can be used with GX Works2 installed in a development office's PC. The favorable GX Developer functions have been incorporated to GX Works2 and the usability furthermore improved. The performance has also been refined thus improving each operation to perform smoothly with a high response. The usability will continue to advance. GX Works2 conforms to the engineering tool international standard IEC 61131-3, and supports structured programming with grouped parts. Programming languages including SFC, ST and ladders, can be used according to each application. In addition, several languages including SFC, ST and ladders can be used together in one program. A ladder is easily modified and edited with convenient key combinations such as [Alt]+[←]/[→] or [Alt]+[↑]/[↓]. Lines are edited only with the keyboard keys. There's no need to switch to the conventional line editing mode. Ladders are easily edited just by choosing. The information of arguments are also shown to reduce errors during ladder input. This function saves time to display and confirm help information during command input. Pressing the [F1] key displays the instruction help screen. 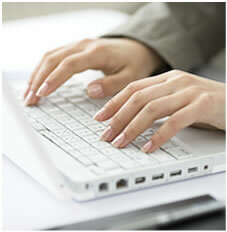 By specifying the search option and pressing the Enter key, the user can search for suggestions. This is particularly useful when a certain device is used many times in the program. Search for devices can also be made in the similar manner by switching the ladder display to the device display. Cross Reference function is used to search for devices/labels used in the project. The docking windows enable to display the Cross Reference window and program editor vertically. The used locations of devices or labels in the program are confirmed with intuitive operation. Inline ST directly writes operation processing. Operation processing is written directly in a ladder with Inline ST (structured text). Creation of a multi-line ladder or FB (Function Block) in another program editor is not necessary anymore. Troublesome numeric operations and character string processing are described easily. By wrapping a ladder block, a long and hard-to-read ladder program is displayed in a compact form. The scale of the window is changed to display the SFC diagram and Zoom. Since the changed scale is retained, the windows are always displayed with the same layout. Pre-prepared special relays/registers of the CPU as well as the buffer memory/XY signal of the intelligent function module is copied as sample comments in the project comments. Time for entering device comments are greatly saved by utilizing sample comments. Set a word device comment for each bit to display the contents of the comment on the ladder. Device comments are copied by copying the ladder of the ladder editor between projects. When copying a ladder onto another program, the device comments in the ladder are also copied. Japanese, Chinese (Simplified and Traditional), and Korean comments can be displayed in GX Works2 English Edition. The function comes useful when working with offices abroad. The setting function of the intelligent function module is now integrated with GX Works2. 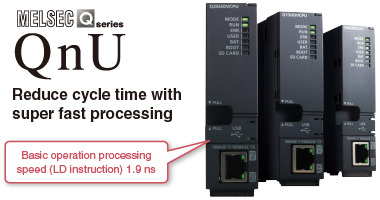 The intelligent function module settings are managed in a GX Works2 project. A network configuration diagram is created by arranging device images on the CC-Link Configuration window using a mouse. A list of refresh devices assigned to CC-Link modules are displayed. CSP+*1, which contains partner product information, can be additionally imported. *1: Refer to the CC-Link Association website for information on CSP+. The device assignment information can be exported to a CSV file and imported into the global label information, making it easy to utilize the information in label programming. Using the predefined protocol function of GX Works2, connection to a device you want to communicate with is quickly made just by choosing it from the predefined protocol library. Even if the external devices are not registered in the predefined protocol library, the desired protocol is easily created. During serial communication, transmitted data, communication signals, and communication statuses can be checked without a line analyzer, making debugging easier. GX Works2*2 enables setting and monitoring of iQSS supporting devices, represented by vision sensors. *2: GX Works2 with version 1.492N or later. The simulation function is now integrated with GX Works2. The program operation is easily checked on a personal computer. Up to four GX Works2 projects on a single pc are available to simulate concurrently. A program is executed in a step-by-step method using the simulation function, finding program errors more easily. Arbitrary devices/labels are registered and monitored, allowing required sections to be confirmed quickly. The current value of the device/label is changed from the watch window. The device values before and after the designated conditions are established can be sampled and displayed in a timing chart. The trace results are saved in a CSV file allowing the device changes to be saved easily. *1: GX LogViewer Version 1.26C and higher is supported. The sampling trace is also used in the simulation function. Status of the speed command (axis speed), two-axis interpolation, and simultaneous start (two axes) are traced and displayed in a graph. The value of each axis is visually checked during the online operation of the positioning module. The real-time monitor of the MELSEC-L CPU can be used by starting up GX LogViewer*2 from GX Works2*3. Verify data of an open project against data of saved project to display the result in an easy-to-view format. 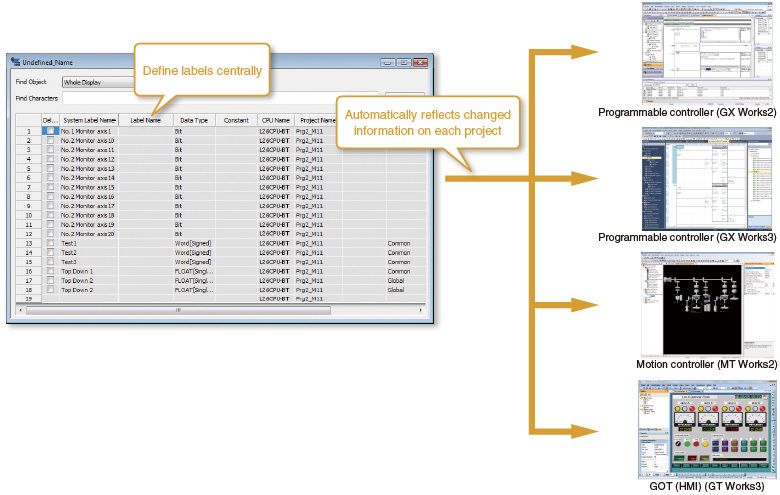 The parameters and the programs in the PLC connected to a personal computer also are verified against the data of an open project. The verification result is saved to a CSV file to facilitate revision of design documents. Erroneous operations in monitoring and searching are eliminated by supporting the Read and Monitor modes similar to GX Developer. The same key operation as GX Developer is used to switch modes. While watching the ladder program, the buffer memory/XY signal of the intelligent function module is monitored in the docking window. Since the name of each buffer memory address is displayed, so there's no need to refer to the manual to see for what the buffer memory is used. Operation status of the entire programmable controller system is clearly displayed. Each module's diagnosis and detailed information is displayed on the monitor for the entire system allowing the problem point to be confirmed quickly. The system is diagnosed on a graphical screen which gives a feeling as if you are watching actual system and equipment. Items to print are specified in details. Also, multiple programs are printed in a single operation. Various program data are exported as a CSV format file. Data are confirmed even on a personal computer that doesn't have GX Works2. Data are saved in the personal computer. Data are mailed to a remote location. Secondary use of data, such as documentation and graphing, is possible using Microsoft® Excel®. Collaborate with other software by handling data in CSV format. Project safety is maintained by limiting user access for each program and parameter. The access level is managed for each user. Setting security not only restricts an access to projects but also prevents the data created by the user from erroneous modification and/or disclosure to unauthorized users. When multiple persons take charge in the same project, unauthorized changes to the project data are prevented. By setting a password for a program in the programmable controller CPU, the program is protected from unauthorized change and leakage. By setting a block password, the FBs in a project which contains in-house software expertise are protected from theft and leakage. By registering the devices that access the CPU, unauthorized access from non-registered devices is prevented. Avoid unnecessary accesses, and protect your valuable program assets. By setting a remote password, unauthorized access of the programmable controller from Ethernet or a public line is prevented. By registering the project revision history, the project is easily recovered to their original state. Projects with a registered history are compared. It is unnecessary to save projects under different names for back up. In addition to the program name, the program title is displayed, allowing the program contents to be understood at a glance. The statements appended to program processes are displayed on a tree view for easy access to them. The processing flow and structure of the program are easily understood and jump to each process quickly. The PLC program can be created with multiple program parts so the program configuration can be seen and parts can be easily used in other projects. The docking windows are hidden to use the screen efficiently. The settings for frequently connected devices can be saved and reused whenever necessary. This eliminates the need for copying and modifying projects for different connection targets. The user can customize keyboard shortcuts. The customized setting can also be saved and exported as a file. Shortcut keys can be assigned to the menus that have no shortcuts assigned by default. Displaying Help information with a single keystroke makes it easier to confirm the operation. Frequently used help screens are bookmarked. What is a Function Block (FB)? Function Block (FB) is a ladder block frequently used in a sequence program and grouped as a part for reuse within the program. FB improves program development efficiency and reduces programming errors to ensure higher program quality. Example) This count process program turns the output signal (Y12) ON after the input signal (X1) turns on for 12 times. A sequence program is created just by dragging and dropping FBs. This significantly reduces program development processes. Using FBs in a sequence program improves its readability because the program only consists of "boxes" (FBs), inputs, and outputs. By grouping frequently used program components as parts, they are reused as many times as required. You are no longer required to copy an existing program and then modify devices. By grouping frequently used program components as parts (FBs) and reusing them, program quality will be uniform and independent from the skill levels of the developers. By grouping important sequence program components involving technology expertise as a part (FB) and protecting it with a password, information leak is prevented. An FB library is a collection of FB parts which is used in simple projects of GX Works2. By using these FBs, settings and operation of the MELSEC-Q/L modules as well as partner products are configured. In addition to the custom-made FBs, useful FB libraries supplied by our partners are available. FBs are also offered for iQSS partner products. The MELSOFT Library has more than 1500 FBs from thirteen companies, and is scheduled to continue expanding. When how to use an FB is not certain, right-click it on the FB Selection Window to display the help information. By using a Structured project, a large and complicated program is structured and divided into parts according to the processing details, control details, and functionalities. A "roll" of ladder program tends to be difficult to view the entire processing. On the contrary, by designing a compact program module for each process in structured programming, coding and debugging will be more efficient and the program quality will be also improved. It also supports complicated structured programming by allowing for a nesting structure which puts a FB in another FB. GX Works2 conforms to the international standard IEC 61131-3. This graphical language represents a program as a ladder which consists of contact points and coils. The structured ladder language is a graphical language used according to the design technique of the relay circuit. The structured ladder allows for nesting FBs. The FBD language graphically represents a ladder by connecting functions and/or FBs. A graphical language for comprehensively describing sequence control. This language pairs a step which describes a process with a transition condition to move to the next step. The step and transition condition are described in the ladder language. The ST language allows for describing control with selection divergence using conditional statements and loops using iteration syntax, similar to high-level languages such as C. This helps creating comprehensive and concise programs. With structured projects, frequently-used programs are saved in user library files separately from the project. By importing these user library files into a project, the program is developed efficiently without having to create it from scratch. Labels are used to give easily identifiable names such as "Production line start signal" or "Start parts supply" to devices. Using labels eliminates device assignment upon system changes. 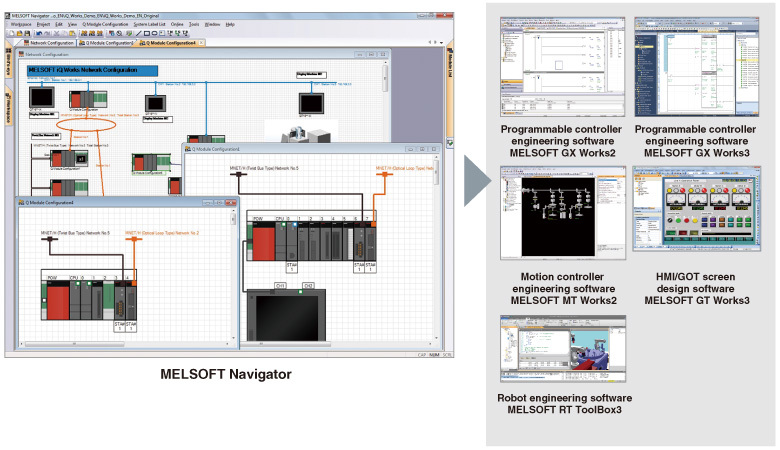 MELSOFT iQ Works is an integrated engineering software product, composing of GX Works3, GX Works2, MT Works2, GT Works3, RT ToolBox2 mini and FR Configurator2. By sharing information such as system designs and programming as the entire control system, the system design and programming efficiency are improved and total cost reduction is achieved. In combination with GX Works3, GX Works2, MT Works2, GT Works3, and RT ToolBox2 mini, this software performs upstream system design and inter-software operation. It provides such convenient functions as system configuration design, batch setting of parameters, system labeling, and batch reading. Multiple project data (programmable controller projects, motion controller projects, GOT projects, and robot controller projects) are managed totally using a workspace. The diagram is easily created by dragging and dropping the modules, and various checks such as power supply capacity check are also performed. System labels are set in one place, reducing the number of processes and preventing setting errors. The set system labels are shared and used with all related projects. There's no need to launch each software and check the integrity. *1: You are still required to set detailed parameters in each tool. With MELSOFT Navigator, labels are shared by the PLC, motion controller and GOT. For example, if a device assignment is changed in the PLC project, the changes are automatically reflected onto the motion controller and GOT projects. GX Works2 now supports the universal model high-speed type QCPU module which has a greatly improved operation and processing speed for basic operations, structural instructions and FB call functions. Use GX Works2 to easily control the next-generation high-speed CPU equipped with advanced functions. *1: Supported by GX Works2 version 1.98C and higher. By coordinating with PX Developer*2, sequence and loop control programs can be created for process/redundant CPU. Collaboration with various FA devices is now more powerful. GX Works2 is used to set and monitor various FA devices on any platform. Improve your product site's efficiency by integrating with high-performance and high-function devices. Configuration, start up and adjustment, operation and maintenance of the simple motion module are powerfully supported. The power measurement module's parameters are set from the GX Works2 without a manual. Swift startup using the GX Works2 supports energy conservation of the system. Parameters for the iQ Sensor Solution (iQSS) compatible partner sensor products are set and monitored, and the sensor's connection state and current values are confirmed with graphically displays, allowing troubles to be handled quickly.